A former dual-sided Little Chef service area on the route to the south. Most of the facilities are on the southbound side. 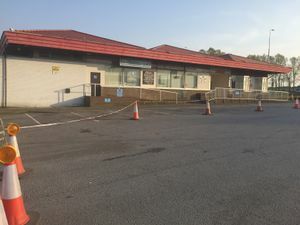 The site is named after the site of the former Barnsdale toll gate or 'bar', which was situated at the junction between the Great North Road and the Pontefract Road during the era of horse-drawn coaches, before the growth of the railways. For marketing purposes the site has often been referred to as 'Doncaster services', but then so have several other nearby facilities. The restaurant as it opened, as a Fortes Autogrill. The southbound side of the services was built in the 1960s by Fortes as a large and formal service area under their Autogrill brand, with Kenwell providing the catering. Crab Tree Lane was diverted around the new building. 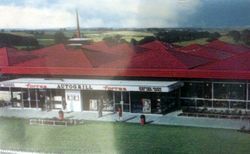 Along with Oxford Peartree on the A34, it was built as a scaled down version of Forte's motorway service station sites, designed for a-roads. For Fortes, the appeal appears to have been that a-roads have much less regulation, allowing them to get a grip on the road with ease. Both Barnsdale and Peartree shared the same building design, with a pointed orange roof. Autogrill supplied the building with a large restaurant and shop. In the late 1960s Barnsdale gained the Pontefract branch of Fortes' Excelsior Motor Lodge, which was American-styled with its bright lights and took up a cross-shape with a short tower section. It later became a Travelodge. Under Forte, the Autogrill name was phased out and Motor Chef, Trusthouse Forte and, for a brief time, Welcome Break were used instead. Restaurant options grew to take in Forte's The Granary brand and there was even a carvery option alongside it at one point. In the early 1990s, the tired motel was rebuilt to keep it in line with Forte's other motels. In 1988, The Granary was replaced by Little ChefHistory. Coupled with the northbound side (below), this made it a pair of restaurants. As the Little Chef was so large, it gained a Coffee Stop, which became a Café Nescafe. Granada changed this to a Burger King, which was later removed and became a Coffee Tempo!. 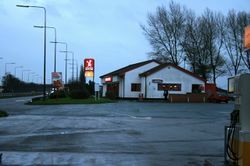 In 2010 the Shell service stations were demolished and rebuilt, allowing the addition of a Select stores on the forecourts, with a Coffee Republic coffee machine situated inside. In 2012, the Coffee Republic machines were replaced with Costa Express. Initially the facilities were on the southbound side only, with a footbridge allowing access to a car park on the northbound side. In 1980 Forte built a Little ChefHistory and a filling station. At the time, this was the first Little Chef here, and it opened outside Barnsdale at the same time as a Little Chef opened outside Peartree. In the 2000s, the linking footbridge was demolished as it was no longer needed. Under Permira ownership in 2004, both Barnsdale Bar restaurants closed, although the furniture was kept. They were both then re-opened the following year by Little Chef's new owners, People's Restaurant Company. On re-opening the Travelodge became Days Inn, symbolising the breakup of Little Chef and Travelodge. People's Restaurant Company then set about adding Coffee Tempo! to the Little Chef offering on the southbound side in 2006. In 2012, Little Chef Express replaced Coffee Tempo! at a time when then owners R Capital had decided to close 67 other branches. This implied continued commitment to Barnsdale Bar, but in September 2012 Barnsdale Bar was included in an extended wave of closures. The former Little Chef on the northbound side is now a Pulse & Cocktails Adult Superstore.